After spending the Thanksgiving holidays with my brothers in Michigan and attending the SSCA Melbourne GAM in December I and Sarah were once again ready to depart for the Bahamas. However once again the weather would not cooperate. This would be my first significant single-handed operation of Sarah since the Mediterranean cruise in 2006 so I really wanted to start the cruise in settled weather. The weather was anything but settled. Even the locals were complaining that this was one of the coldest and windiest Decembers they could remember. Fortunately for me I had paid for the Melbourne berth for a month (it was cheaper than 2-weeks), so I just laid back and waiting for the weather to settle. Vero Beach City Marina Location It did, one day after my month was up, but I was at last underway heading south. That evening, Dec 17, I rafted next to another boat on a mooring provided by the Vero Beach City Marina (screen capture on the left). This was my last chance to pick up provisions before heading across the Florida Straits. I made ample use of the free shuttle bus service provided by Vero Beach. 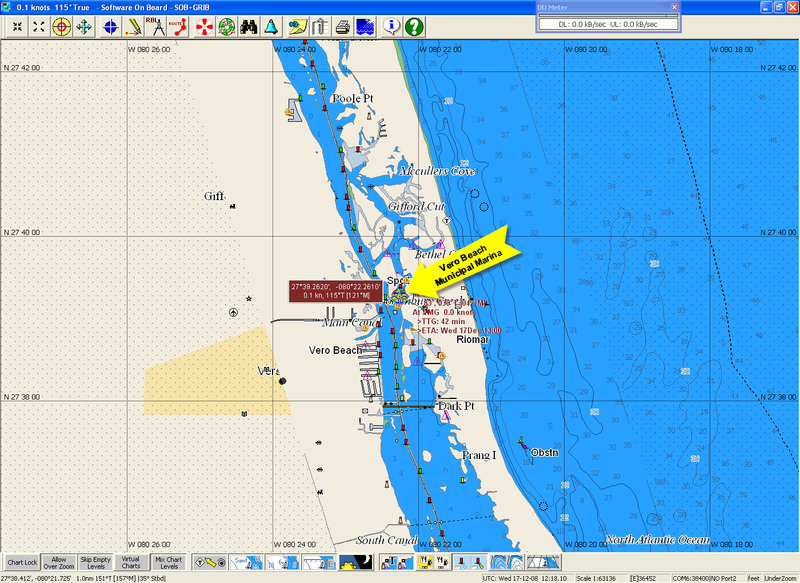 On Friday, Dec 19 I motored further down the ICW and anchored off the Harbortown Marina in Ft. Pierce. I spent the winter of 2004/2005 in this Marina preparing Sarah to sail across the Atlantic to Portugal. 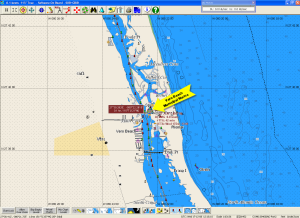 The next afternoon I departed Ft. Pierce and headed out the inlet into the Florida Straits. I turned south down the coast as far as the St. Lucie Inlet. 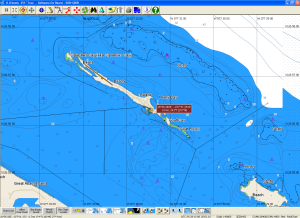 This was necessary to to allow me sail an almost due east course to the White Sands Ridge entrance to the Little Bahama Bank. The route I sailed is shown by the black line on the chart on the right. Of course in order to sail a course due east across the Gulf Stream I set Sarah on a heading of 110°T. 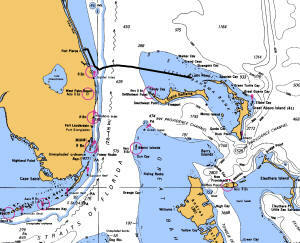 The simplest method of navigating across the Florida Strait is to assume a constant northerly current of about 2 knots. The core of the Gulf Stream has a current of 3.5-4kts, but the 2 kts provides a reasonably accurate average of the current for the entire crossing. Given Sarah's speed under power of 6 kts and a distance to cross of 48 nm provided a set to the north of 16 nm for crossing. Therefore I chose a heading (110°T) that, without a current, would be a course to a point 16 nm south of the White Sand Ridge. 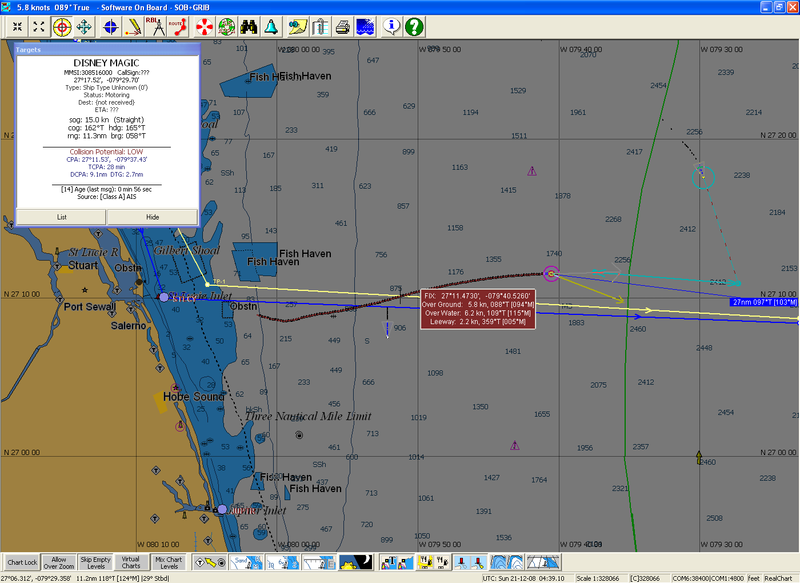 In the screen capture on the left you can see Sarah's track after I turned to 110 off St. Lucie. Initially our track was on that course then we came into the Gulf Stream and Sarah began to track to the ENE. Eventually we reached the core of the current and our COG began to adjust back down toward our heading of 110°T. The screen capture on the right is a little hard to see because I had set the display for night viewing and forgot to re-brighten the display for the screen captures. There is normally a lot of commercial ship traffic in the straits. At this time of year a lot of that traffic is cruise ships. 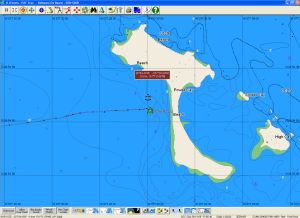 At one time I was tracking 3 cruise ships with AIS. 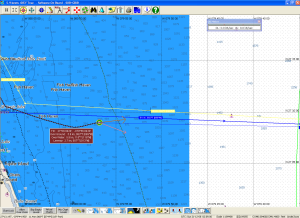 In the screen capture on the left I had contacted the Disney Wonder because our CPA (Closest Point of Approach) was going to be less than 2nm. I contacted Wonder to insure they were not going to change course in a way that would have reduced that CPA. I was comforted to hear that they had me plotted and they would maintain a CPA of 1.6nm or more. Sarah's Track Having Crossed the Gulf Stream If you click on the screen capture and view it at full resolution you can see (in the ship data box, next to the ship position) that Sarah is now heading on an ESE course over the ground (COG) and the core of the Gulf Stream has been passed. There is still a fairly strong northerly current, but it is diminishing. 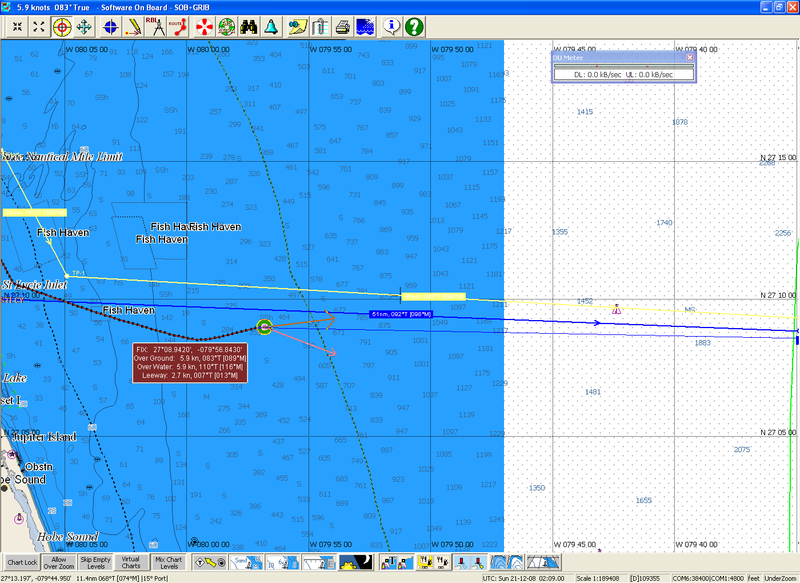 I had adjusted the course during the transit, turning Sarah more to the south (120°T), which was really not necessary. 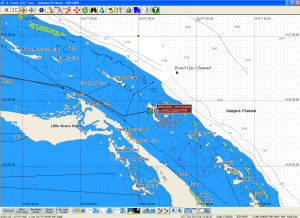 I then had to adjust the course more to the north as we approached the Little Bahama Bank. If I'd left the heading at 110°T for the entire we passage we would have come out right on the White Sand Ridge. 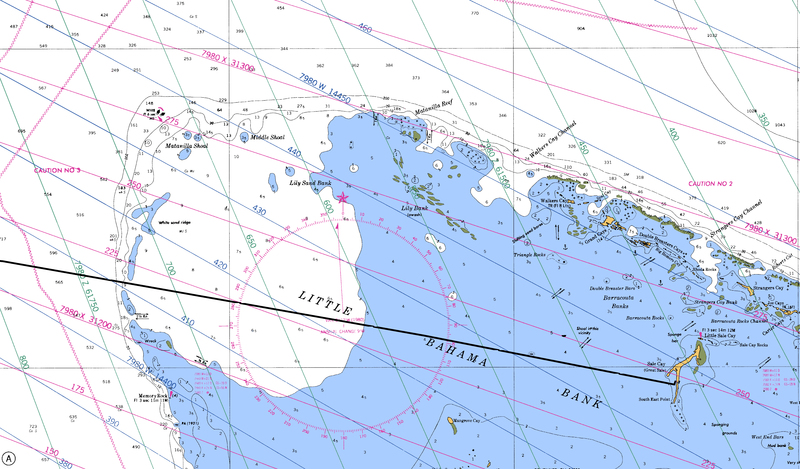 In the last few hours before I entered the Bahamas the effect of the Gulf Stream was negligible and we crossed the White Sand Ridge on an ESE course about 0440 AM. 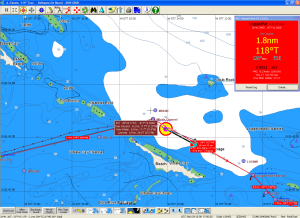 At that point I was still 48nm from my planned anchorage for the night at Great Sale Cay. So I still had another 8 hours of motoring across the Little Bahama Bank before I could get some sleep. At Anchor Great Sale Cay, The Bahamas I arrived off Great Sale Cay around 1230 PM and dropped the hook. I was really tired, more than I thought I would be. I had just enough energy to fire off a few emails via the SSB to let everyone know I had arrived safely and then I totally crashed. I took this picture before I crashed of the completely empty anchorage at Great Sale Cay (not a common thing). I was so tired I didn't really choose a good place to drop the hook. 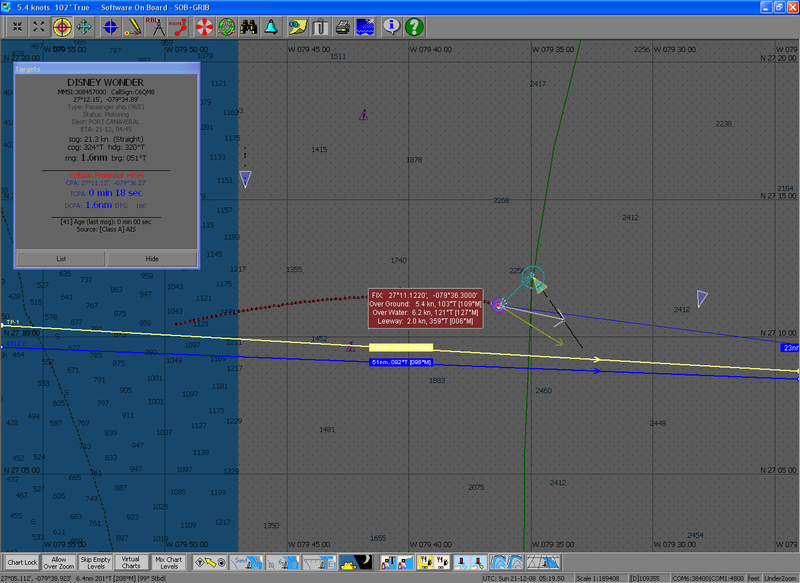 The screen capture on the right shows where I initially anchored. After a few hours of sleep I woke to the boat rocking a good deal. 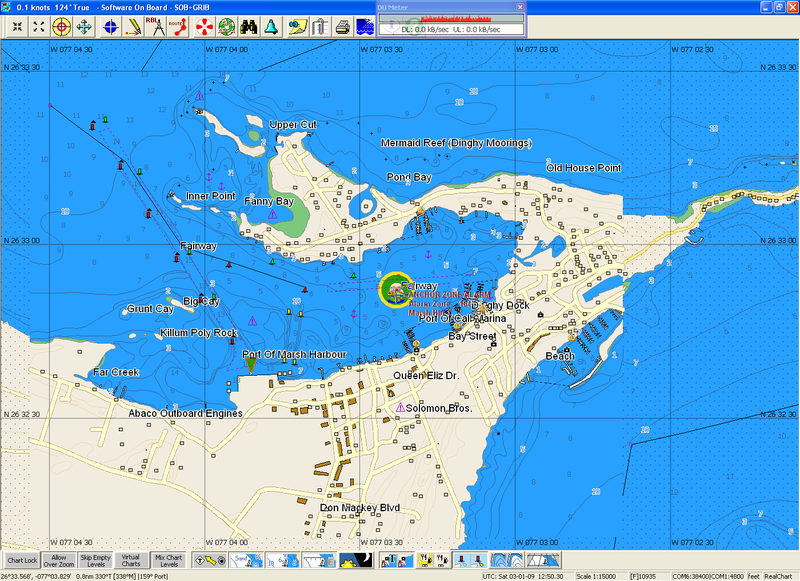 Going on deck I realized I had not gone far enough into the harbor get protection from seas coming from the NW. So I pulled up the anchor and moved further north. Of course by then the anchorage was starting to fill up with boats that left Lake Worth (West Palm Beach, FL) about 12-24 hours before I left Ft. Pierce. So I wasn't able to get as far up into the harbor as I would have liked. Protection from the NW was only an issue for that night as I had planned to head east the next day to the Sea of Abaco the following day. It was necessary to leave in the morning to avoid the strong easterly winds that were expected later that day and for the next several days. When I got up the next morning I still felt very tired, actually weak. I decided I might not just be tired from the all-nighter. I decided to stay put in Great Sale Cay and wait for this weakness to pass, which meant I probably wasn't leaving for several more days. 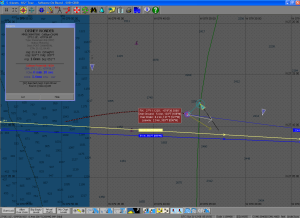 As forecast the winds shifted to the NE the next day at bout 20 kts. The wind stayed between 15-25 kts for the following 2 days. Fortunately the holding in Great Sale Cay is very good (clean sand) and the anchorage is protected from the NW through the SE. This small trawler was anchored next to me for all of that time. As were several other sailboats. I used the time in Great Sale Cay to get a lot of rest and pump my self full of chicken soup. That seemed to work and after 48 hours I felt normal again. Now I just had to wait until the easterly winds died down a bit. Departing Great Sale Cay The winds died by mid-day on Dec 24, but I decided to wait until the following morning (Christmas Day) to leave Great Sale Cay. I was followed out of the anchorage by one of the sailboats with whom I shared this anchorage. 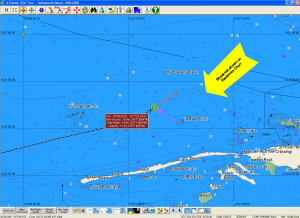 As I headed east toward the Sea of Abaco, passing north of Little Abaco Island and the Veteran Rock near Foxtown, I suddenly noticed the complete lack of soundings on the Navionics charts used on my Raymarine chart plotter. 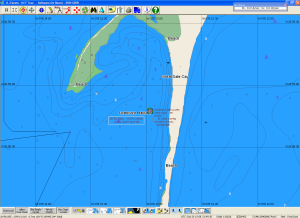 I went below and reviewed the Exlporer paper charts of the area and the C-Map charts used by my PC-based chart plotter, SOB. The screen capture on the left shows the C-Map chart of the same area and a 6' shoal that extends across my previously planned course. 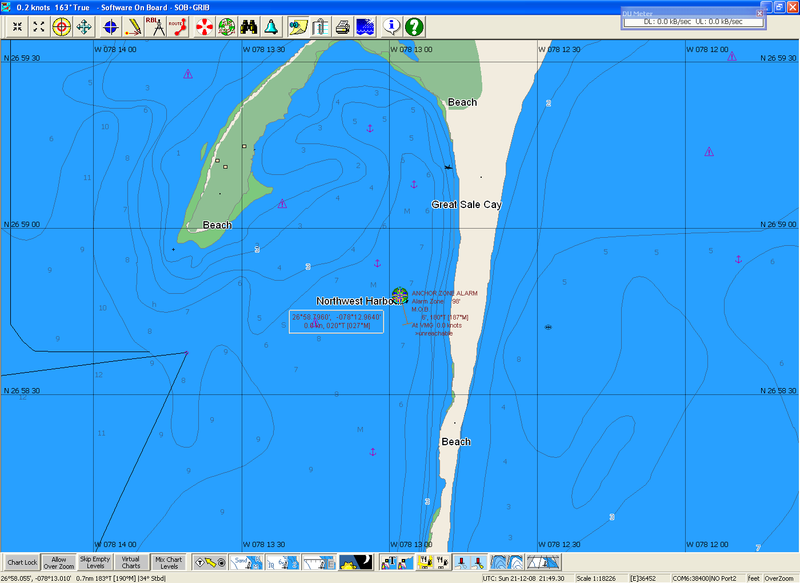 Now Sarah will cross a 6' shoal, but knowing that the cartography of this area can be as much as 100 years old I try to stay away from shoals less than 10'. Based on my Exlporer and C-Map charts I turned Sarah further north to avoid the shoal. 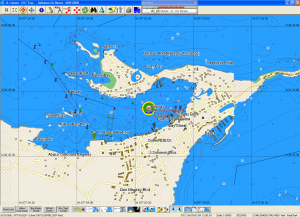 While in Melbourne I had updated my Navionics charts to the latest version, after discovering the older version did not have the Cape Fear Inlet properly placed. Later that afternoon I dropped the hook off Powell Cay in the Sea of Abaco. I had planned to clear Bahamian Customs and Immigrations (C&I) at Spanish Cay, which I had passed on the way to Powell Cay. This was Christmas Day and I figured the C&I agent would not be at work today and probably wouldn't appreciate being hauled to work to clear a single boat. So I spent Christmas evening anchored off the uninhabited island of Powell Cay. In April, 2004 I crewed for friends Frank & Sharon Palumbo on their yacht Windwalker in the Abacos. We also anchored for the day off Powell Cay. At the time we noticed an abandoned crane, partially sunk in the anchorage. Well in 2008 it is still there. Now it is accompanied by a 50' ketch with apparently no one onboard. The ketch is flying a Bahamian flag and was tied to the crane (in addition to having at least one anchor set), so I guess this is a home. Maybe the owners were with family for Christmas. Maybe I should wonder why I was spending Christmas in this anchorage by myself on Sarah - perfectly normal as far as I'm concerned. 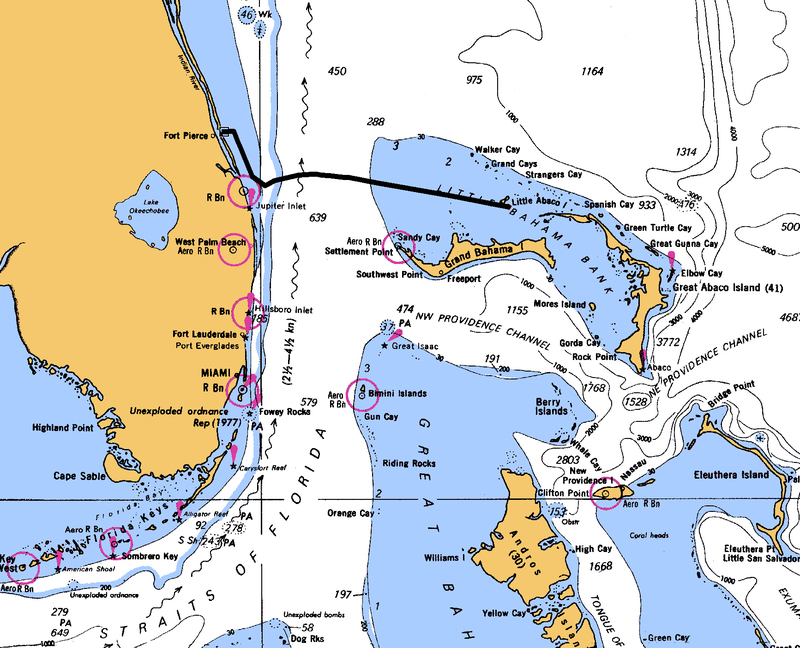 The day after Christmas I pulled up the anchor and motored back north to Spanish Cay. That afternoon the C&I official came over from Cooperstown and I completed the paper work to allow me to legally cruise the Bahamas for the remainder of the winter. I was provided a 120 day visa so I will need to leave the Bahamas by this time in April. If I want to stay longer I'll have to either apply for a Visa extension or leave the country for a few days and return. Sarah doesn't have to leave. My temporary cruising permit allows me to keep Sarah in Bahamian waters for 12 months. Back to Powell Cay After two nights in Spanish Cay I returned to Powell Cay for one more night at anchor. I had made some modifications to my anchor to chain hookup and I wanted to test it as soon as possible. Turns out I had to make another change to the hook up, so this was a good decision. 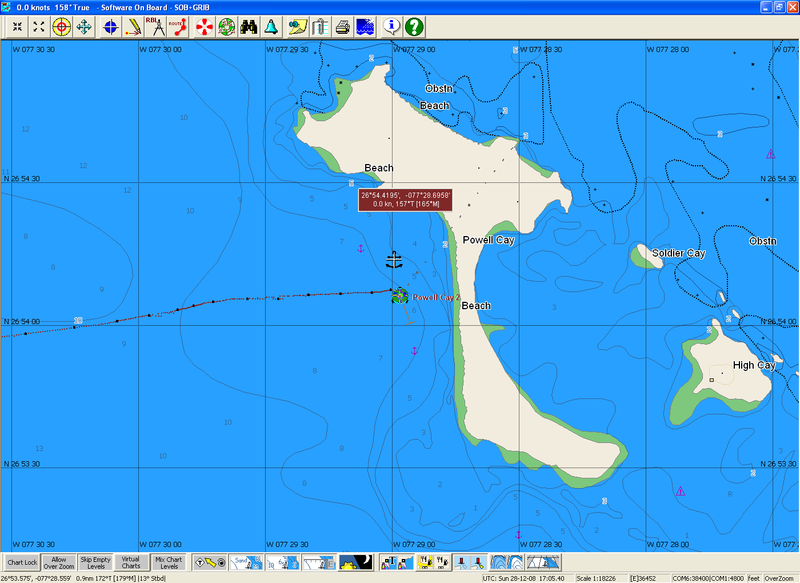 Powell Cay Anchorage ... and this Westsail 32. The next day I continued down the Sea of Abaco, past Green Turtle Cay. Whale Cay Then through the Whale Channel. The Whale Channel (shown in the screen capture on the right) is one of the few places in the Abacos were deep draught vessels must venture outside of the protective string of islands and reefs. When the winds are strong out of the N-NE this channel can become dangerous and un-passable. When Sarah and I transited the channel it was nearly flat. Marker For Cruise Ship Channel On the other side of the Whale Channel is the Loggerhead Channel leading to Great Guana Cay. This channel was originally set up for cruise ships (Disney Line, I believe) to anchor of Great Guana. The cruise ships no longer put into the Abacos but the dredged channel and channel markers are still there. In the Loggerhead channel I passed this small boat that was diving for either Conch or Lobster. Baker's Bay, Great Guana Cay That afternoon I dropped the hook in Baker's Bay of Great Guana Cay. The next day it was a short motor-trip of less than 2 hours from Baker's Bay to Marsh Harbor. This is the dinghy dock in Marsh Harbor. I have never been here at this time of the year, but the number of anchored vessels and dinghies tied to this dock is much less than I remember when Mike Repass and I were here in May, 2005. I'm sure the economic issues have kept a lot of boats from cruising this winter, but I'm also sure the weather has had a lot to do with it. The lousy weather that held up Steve and I on the way to the Bahamas affected most of the other cruisers as well. I decided to stay in Marsh Harbor for about a week to enjoy the access to restaurants and shops and just chill out for awhile. One day before my planned departure from Marsh Harbor I started my Norther Lights M643 generator, as I had done twice a day for the past week. Within a minute or two the generator shut down. I restarted the generator, but it shut down again. This was the evening, so rather than trouble shoot the problem in the dark I started the main engine and used it to charge the batteries and run the refrigeration. The next morning I once again tried to start the generator and it immediately shut down. I started it once more and quickly looked at the exhaust - no water coming out. I really didn't understand why a lack of water flow would shut down the engine, but clearly that was a major problem. What I didn't understand at that time was that fixing the generator would take over a month, the replacement of the raw water pump and the water lift muffler. This long tale of woe has been documented on a separate page: The Genset Saga. While this was a frustrating and expensive adventure the picture below reminds me that there are many worse places in the world to have to deal with a broken genset. Frontal Passage in Marsh Harbor During the period I was anchored in Marsh Harbor (all of January, 2009), the Abacos experienced an unusually large number of frontal passages. During the winter it is common for the Abacos to have 2 or 3 frontal passages per month. During January, 2009 we average more than 1 per week. Generally the fronts themselves were not severe, but we did get a lot of wind for about 24-36 hours prior to the frontal passage and about 24 hours afterward. As a front moved off the SE coast of the US the winds in the Abacos would shift to the SW and start to build. By the time the front had entered the Abacos, the SW winds in Marsh Harbor would be blowing over 25 kts. When the front came through the winds would shift to the West, the NW and finally North. Fortunately the holding ground in Marsh Harbor is very good - mostly fine, firm sand. Sarah's anchor never moved more than a few feet during 6 weeks I was anchored in the harbor. Because of that good holding ground the harbor tends to fill up in the 48 hours before a frontal passage, then empty out 24 hours after the front has gone through. After the genset was once again working, I returned to Marsh Harbor after one night in the Marsh Harbor Boatyards. We still had fresh winds out of the SE, which would have made the crossing of the NE Passage slow and maybe a little uncomfortable. So I decided to spend a couple more nights in this harbor before departing for the Eleuthera. After a few more nights in Marsh Harbor I finally abandoned my plans to head down the Exumas chain to George Town. By this time is was nearly the end of Februrary. Single-handing down Eleuthera and the Exumas was going to take a significant amount of time. I figured the earliest I might arrive in George Town would be around the middle of March and probably a week or two later. By then it would be time to start heading out of the Bahamas. George Town was never a destination in my plans, but merely a base from which I could visit some of the more remote islands in the Southern Bahamas. I had no real interest in visiting George Town as I expected it would be not much more than a small version of Marsh Harbor. So I spent the rest of the winter in the Abacos, mostly anchored in Marsh Harbor.